In general I am wary of introducing technological prosthetics into tabletop roleplaying games. Often, I think such tools are patches over needless rules complexity. I would generally prefer to adjust the rules so that they can stand efficiently without machine crutches. However, one place where I relax my attitude in this matter is the combination of results from several random tables. Occasionally I appreciate the slow, ritual process of rolling dice, consulting a table manually, noting a result, repeating this process over and over again, and then finally reconciling the complete set of results. However, most of the time reducing a 20 minute operation to one that takes mere seconds is a trade I will take. 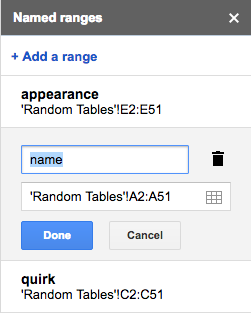 So, what tools exist for automating the juxtaposition of multiple random tables? Ultimately, I will advocate using a simple spreadsheet, which I argue has benefits in terms of both flexibility and simplicity over many other more specialized solutions, but first I will survey the alternatives. 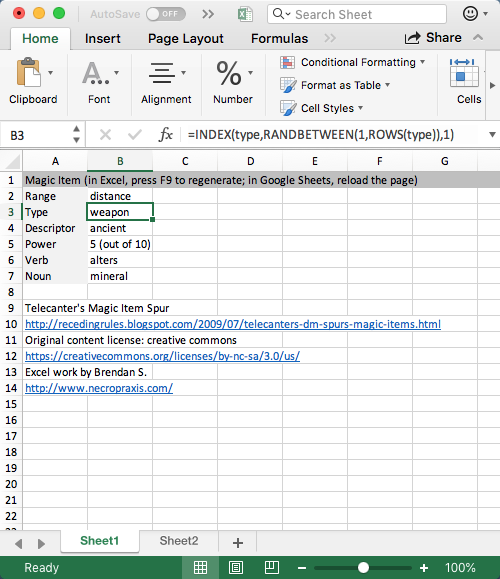 Using a spreadsheet, once you know a couple simple tricks, is flexible and quick, and the social media aspect seems easily handled with Google Sheets, Dropbox, Google Plus, Twitter, Reddit, or whatever. The main benefit for me of using a spreadsheet though is encapsulation. All the other solutions I have experimented with involve a mess of files, links, or other elements, which end up difficult to organize or share. In contrast, the method I outline here keeps all the subtables together in a single spreadsheet workbook file, with one column per table in the second sheet. This ends up interoperating easily with the most natural format for storing random tables, which is a plain text file having one result per line. Next, name the ranges for each column so that you can refer to them by name elsewhere. To name a region, highlight the column data and the type the name in the upper left cell address box—the text in the blue box below. Do this for all columns (there are six in this example). You can organize Sheet1 visually in whatever way you want. I have the generated content in cells B2 through B7 here, with labels to the left and credits below. Now, every time you recalculate the sheet, you will get a new result. In Excel, press F9 to recalculate the sheet. 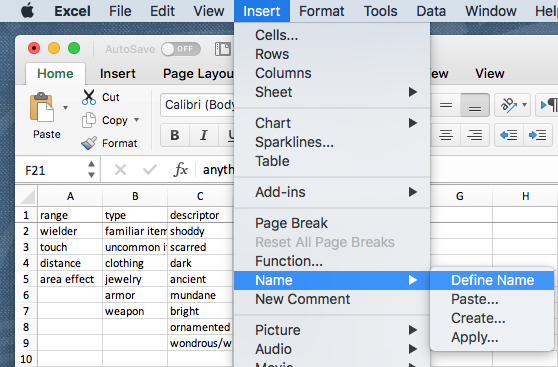 In Google Sheets, reload the page. Upload this to Google Sheets, and you can share it with others, or embed the result in a blog post or other web page using the following iframe code. Just update the URL. Every time you reload the page that includes the iframe code, you will get a new result, as you will see below. (Try reloading this page.) I have highlighted the random content area in red to make it clear for this example. Edit 2018-09-18: I find the embedded iframe presents strangely on mobile browsers, at lease Safari and Chrome for iOS. So maybe link to the spreadsheet rather than use embedding. Click here for the spreadsheet mentioned in the above paragraph. This approach is portable, both in the software compatibility sense and in the will work on your phone sense. I tested these sheets on the Google Sheets, Numbers, and Excel apps for iOS. They all work, even when offline, though there are some minor differences in the user interface, and the free version of Excel for iOS prevents saving. Generally, to generate a new result using a phone or tablet spreadsheet, close and reopen the document. The Google Sheets app seems to be the most full-featured and flexible, but really as a simple viewer any of these works. Once you have created one of these, it is relatively straightforward to make a copy the workbook file and edit the copy to make another generator out of different tables. To do this, you may want to delete or rename existing region names. I explain how to do this next. In Excel, you can delete existing names for ranges using Insert > Name > Define Name, highlighting the name, and then clicking the minus button. Okay, now that you have seen a simple proof of concept example, how does this compare to the other solutions? The Vornheim aristocrat generator is one of the classic examples for me of this kind of multiple table generators. Here is an automated excel version (content used with permission). Buy Vornheim; it’s great. Random Devilspawn from this post (note how easy it was to embed the generator at the bottom of that post as well). The other solutions are mostly unitaskers, unlike Excel, which is a useful tool in its own right. And keeping all the subtables nicely contained in a single workbook file is extremely helpful, especially in comparison to the mess of files I have to automate, say, some of the chapters from Seclusium (such as this chapter that is basically a magic item generator). Though the above example provides all the functionality most generators require, spreadsheets have almost unlimited flexibility, and you can make any particular generator as complicated as you want, if your time is worthless. I tried to keep the example above as simple as possible for ease of use and portability, but there are a few other functions that might be worth the effort. For slightly more complex generators, two other functions may be useful. 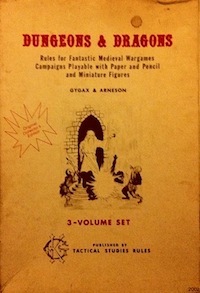 The first is RANDBETWEEN(), which can serve as a basic dice roll. For example, =RANDBETWEEN(1,6) yields 1d6. =RANDBETWEEN(1,6)+RANDBETWEEN(1,6) yields 2d6 (and so forth). Use this function to instantiate values for elements such as number of monsters appearing. I use this in my Devilspawn generator to join the number of attendants and the description of attendants into a single result (check the contents of cell B10 in the first sheet). This entry was posted in Techniques and tagged generator on July 22, 2018 by Necropraxis. 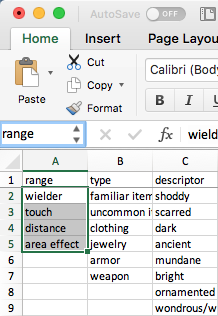 All the spreadsheet functions should be identical on Windows. Probably easiest to download one of the example workbooks as an xlsx file from the Google Sheets links and open it using Windows Excel. 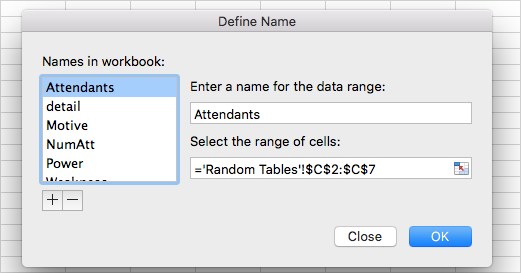 From there, you can change the contents of the random tables and tweak the references on Sheet1 until it fits whatever set of tables you want to automate. The menu to access the name manager may be different in Windows, but that is not critical functionality to begin with. Or, you could just add it to your own Google Drive and do everything online using Google Sheets. That has the benefit of working similarly on different operating systems. I prefer creating the workbooks in Excel, but Google Sheets should work too. I would be glad to answer any specific questions you have. Oh phooey, I’m sorry I was being a troll. It was late and I was tired. This is really excellent. Thanks for posting this! 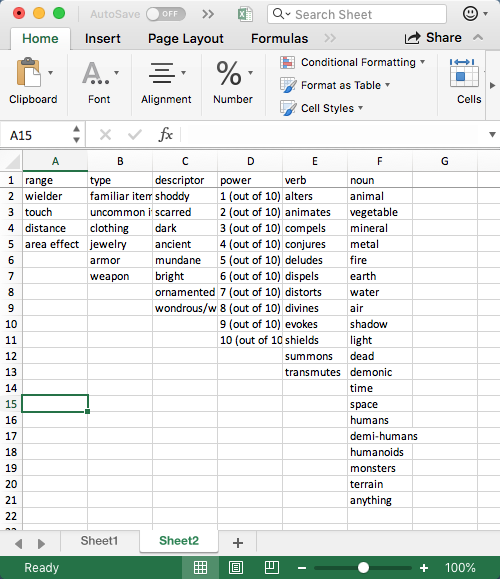 Working on using this with equipment packs to make a character generator for my house rules. In addition to the other generators you’ve listed I would highly recommend perchance.org. This relies on a cell with label race, but you could also just use an absolute cell address, such as A1. Unfortunately, I don’t think there is a way to do a case statement in excel, so you either need to do a nested IF like this or use a one of the table lookup functions (VLOOKUP, HLOOKUP, or LOOKUP). The second approach is probably the way to go for ease of interpretation and maintainability. I haven’t forgotten about this but I also haven’t had a chance to look at it again systematically. I do plan to check out the new features and potentially update this post at some point, however.